Cập nhật ngày 27/12/2016 lúc 9:37:00 AM. Số lượt đọc: 1075. Jasminanthes Blume (Apocynaceae, Asclepiadoideae, Marsdenieae) is a small Old World genus of six species (Endress et al. 2014). Its type species, Jasminanthes suaveolens Blume, is from Java. However, the centre of diversity of Jasminanthes is mainland Asia, particularly China, where the remaining congeners are found (Gilbert et al. 1995, Li et al. 1995). Jasminanthes was considered to be a large-flowered Marsdenia R.Br. by Forster (1995). However, the very broad circumscription of Marsdenia adopted by Forster is not based on phylogenetic evidence and has not been generally accepted in later works. For instance Gymnema, also considered congeneric with Marsdenia by Forster (1995), was retained in floristic works such as Jagtap and Singh (1999) and Watson (1999). The phylogeny of Surveswaran et al. (2014) does not address whether Gymnema should be merged with Marsdenia. The purpose of the present paper is limited to validate a new taxon and we believe that its correct placement is in Jasminanthes. Jasminanthes is separated from Marsdenia based on its large flowers (>15 mm long) with salverform corolla and by its inconspicuous to absent staminal corona. In contrast, Marsdenia usually has much smaller flowers (<10 mm long) with urceolate or rotate corolla and conspicuous staminal corona. If molecular evidence later proves that Jasminanthes is indeed to be considered within a broadly circumscribed Marsdenia, a new combination will be required. In Vietnam, no species of Jasminanthes have been recorded to date (Ho 1993, Tran 2005). However, recent fieldwork in Xuan Lien National Park, Vietnam, yielded a collection of Jasminanthes that was identified as a new species based upon comparison with the known species in the literature and specimens at BK, BKF, BM, HN, HNU, HNPM, IBK, IBSC, K, KUN, KYO, P, SING, TI, TO, TUT, and VNM. 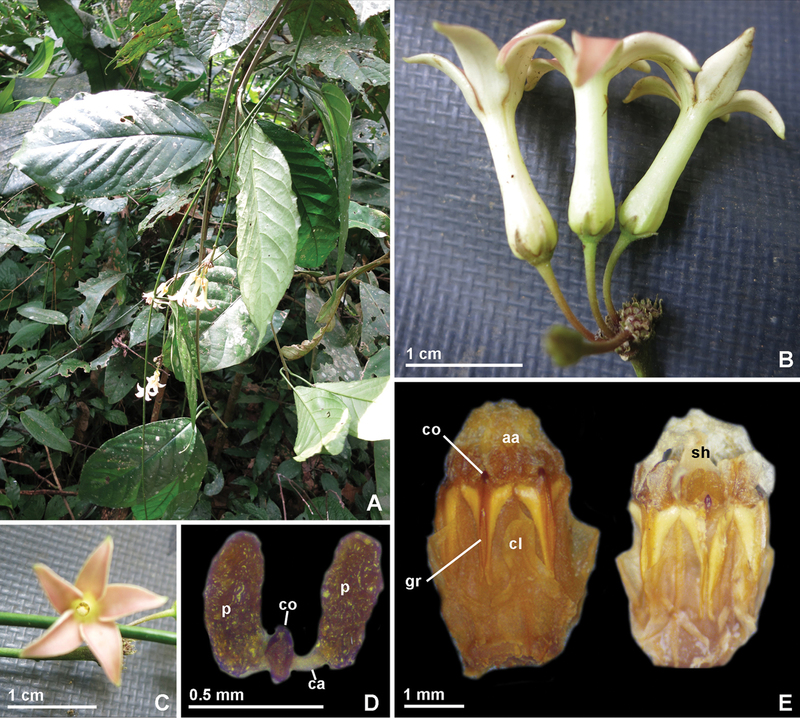 Here we describe the new species and provide a detailed table of character differences among the species along with a key to the species of Jasminanthes. Jasminanthes xuanlienensis T.B.Tran & Rodda, sp. nov.
Vietnam. Thanh Hoa province: Xuan Lien National Park, 720 m, N19°59'14.6", E104°59'49.1", 22 April 2013, Do Van Hai et al. XL 904 (HN, holotype; HN, isotype). The species is named after the type locality, Xuan Lien National Park, Thanh Hoa province, in northern Vietnam. Jasminanthes xuanlienensis was found growing in primary evergreen forests on limestone soil of Xuan Lien National Park. It was collected in flower in April. Plants observed growing in the vicinity include Piper acreanum C.DC., Beccarinda tonkinensis (Pellegr.) B.L.Burtt, Sarcosperma kachinense (King & Prain) Exell, Hoya vercillata (Vahl) G.Don, and Alangium salviifolium (L.f.) Wangerin. Jasminanthes xuanlienensis is known only from the type locality, an area still poorly known botanically; its preliminary conservation status is therefore Data Deficient (DD; IUCN 2014). The six species of Jasminanthes are clearly distinguishable from one another based on morphological characters (Table 1). The new species can be easily separated from all Jasminanthes species as it has very long peduncles (14–18 cm long), while the longest peduncles observed in other species are those of J. pilosa (Kerr) W.D.Stevens & P.T.Li and J. saxatilis (Tsiang & P.T.Li) W.D.Stevens & P.T.Li), which reach 4 cm long. Jasminanthes xuanlienensis has unique pink corolla lobes whereas the other species have white corollas, or greenish corollas in J. saxatilis.